This last week I took a short trip down the road to Pendleton, OR to visit my family. OK, so the trip isn’t that short (actually is 300 miles) and I am still going to be here a few more days. Since I am currently looking for a new career opportunity, I have had a bit more time on my hands and thought, ‘what the heck, I may as well go visit.’ So far it has been pretty good and I have been able to meet up with a few close friends that I still have here. 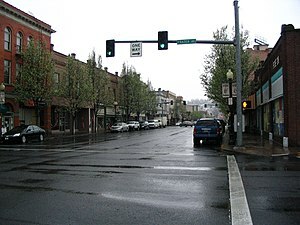 Pendleton is approximately 16,000 people. A pretty small town. With that comes good things and bad things. The good things are: it is a safe community, it’s really laid back, and people are generally pretty friendly. The bad thing however is that with a small town, you practically know EVERYONE. Being out of Pendleton for approximately 7 years now has let’s just say liberalized me a bit and I am much more used to being “lost in the crowd” in larger places. To be completely honest, it is pretty nice to be incognito every so often. I mean, here in Pendleton, let’s just say you go buy some beer; before you get home, the rest of your family practically knows. Why you ask? Well, most likely it was your church youth group leader from back in the day, that now has a part-time job at the grocery store. A God-fearing soul like myself should not be buying such things after-all. So, that was bit of an exaggeration. But at least you get my point. Today my friend Megan and I went downtown to a restaurant we had never been to before. While we were there, there was a total of 10 people that we knew. YES, TEN! And remember, I have not been living in Pendleton for 7 years! After this much time it brings all kinds of awkward feelings and situations… ‘Hi, Mrs. Math teacher from my sophomore year of high school (that probably doesn’t remember me…. or DOES she! )’ Or it’s one of those thoughts… ‘Oh crap, look who just walked in, we must leave….’ Let’s just say it was a good thing we each had a beer in hand! Both tonight and tomorrow night will include trips to the local “Saloon” where I am sure I will run into at least half of my high school class. This will be entertaining to say the least!